Prominence Pedestal Display Cases raised base has been designed to focus the attention onto your display. Multi-faceted aluminum framing and hexagon-shaped corners unite to create Prominence's distinctive look. The 24" high base features a locking access door for convenient interior storage. Tempered glass, built-in locks and steel shelving hardware all come standard. 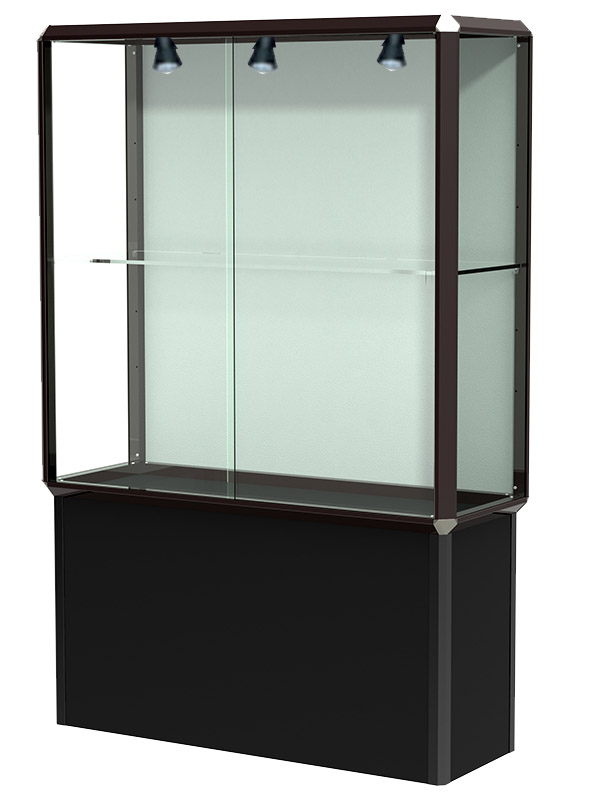 Each case includes two adjustable tempered glass shelves with hardware. The Prominence Pedestal series is offered in either a 2' wide or 4' wide version and is available with or without interior lighting. 2' wide cases have choice of clear glass background for 360 degree perspective or fabric plaque background with velcro strips for attaching plaques. 4' wide cases come with plaque background only. 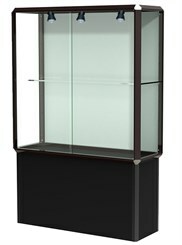 2' Prominence Pedestal Display Case is sold above. Measures 24"W x 24"D x 72"H overall. Ships fully assembled. Shipping weight 215 lbs. PRICE INCLUDES SHIPPING! (Truck shipment - see Terms & Conditions). Please allow 2-3 weeks for delivery. Like Y4095 but with two multi-directional spotlights. 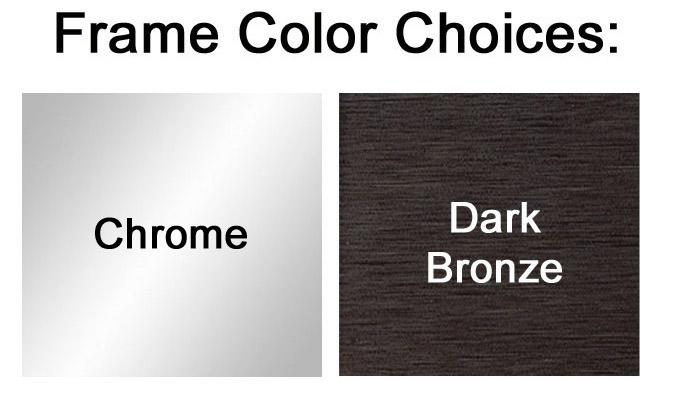 Black pedestal base with choice of Chrome or Dark Bronze frame. Plaque fabric background. Measures 24"W x 24"D x 72"H overall. Ships fully assembled. Shipping weight 215 lbs. PRICE INCLUDES SHIPPING! (Truck shipment - see Terms & Conditions). Beautifully displays your awards and precious collections. Black pedestal base with choice of Chrome or Dark Bronze frame. Plaque fabric background. Measures 48"W x 18"D x 72"H overall. Ships fully assembled. Shipping weight 303 lbs. PRICE INCLUDES SHIPPING! (Truck shipment - see Terms & Conditions). Like Y4097 but with three multi-directional spotlights. 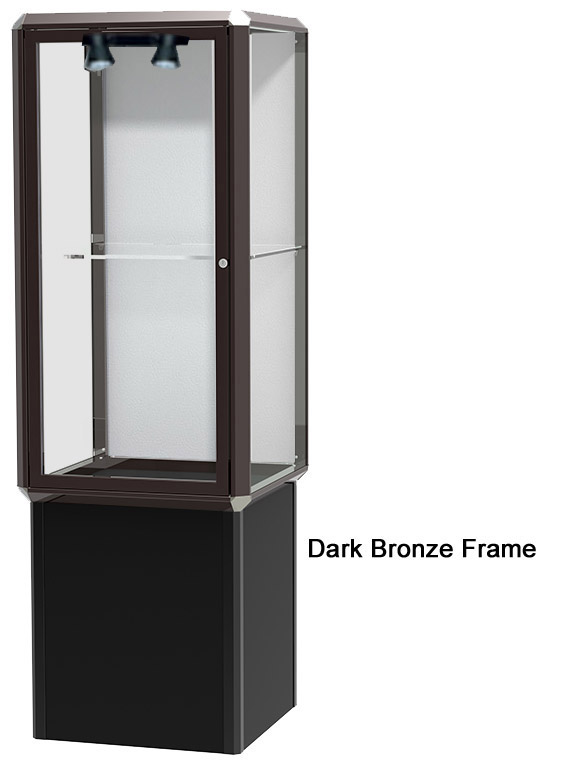 Black pedestal base with choice of Chrome or Dark Bronze frame. Plaque fabric background. Measures 48"W x 18"D x 72"H overall. Ships fully assembled. Shipping weight 303 lbs. PRICE INCLUDES SHIPPING! (Truck shipment - see Terms & Conditions).